The Panasonic GF1 helped convince a lot of photographers that a compact shooter could feel delightfully professional. The Lumix DMC-GX1 is Panasonic's most evolved Micro Four Thirds camera yet, and it delivers huge on that promise—but is it enough? The Panasonic GX1 represents three years of iteration on Micro Four Thirds cameras, combining the three best elements from Panasonic's previous cameras into one: the blocky, retro design of the GF1, the G3's 16-megapixel sensor, and the touchscreen LCD first introduced on the GF2. The GX1 is a sturdy shooter with flexible controls. This is no point-and-shoot camera: It fills up your hands like an old rangefinder. Are you a DSLR snob who loves buttons? It has lots of buttons. ISO, drive, AF mode, and white balance are neatly mapped to the four directional buttons on the back panel. There's only one click wheel on the camera, which controls both aperture and shutter speed in manual mode. To toggle between them, you simply push the wheel into the body—you guessed it—like a button. If that's not enough, there are also two programmable Fn keys, but I didn't end up using them much. The reason for this is the camera's awesome touchscreen, which allows you to control the most-important shooting settings without ever pushing a button at all. As with the GF3's LCD, you can even select the spot you'd like to focus on and fire the shutter with just a tap. This handy touch focus allows you to drag your point of focus when you're shooting video as well. The camera isn't the fastest in its class, but the autofocus performs very well even in low-light conditions. Shutter lag is minimal. The camera's continuous drive shoots only 4.2 fps and its buffer chokes up after 7 frames when you're shooting RAW. Like Panasonic's micro four thirds predecessors, the camera takes very nice photos in daylight, and the improved sensor resolution only makes daylight shooting easy. What really sets this camera apart, as I mentioned before, is how easy it is to use. Any settings adjustment is always just a quick tap away. That means more time taking pictures, and less time staring at your camera. The camera shoots perfectly acceptable HD video that you can upload to YouTube, and you could even shoot something on a tripod in a pinch, but the GX1 shouldn't be your go to for serious video production. Like all micro four thirds cameras, the GX1's image quality gets noticeably noisy above ISO 800, and in some low-light situations, photos shot above ISO 400 show some noise when you blow them up to 100 percent. The camera could use a faster processor to boost how many continuous shots it can take, because setting up shots is so easy that waiting for the camera to process RAW files can be a drag. Yes, if you want a smaller camera that handles like a DSLR and takes awesome photos for less than $1000. 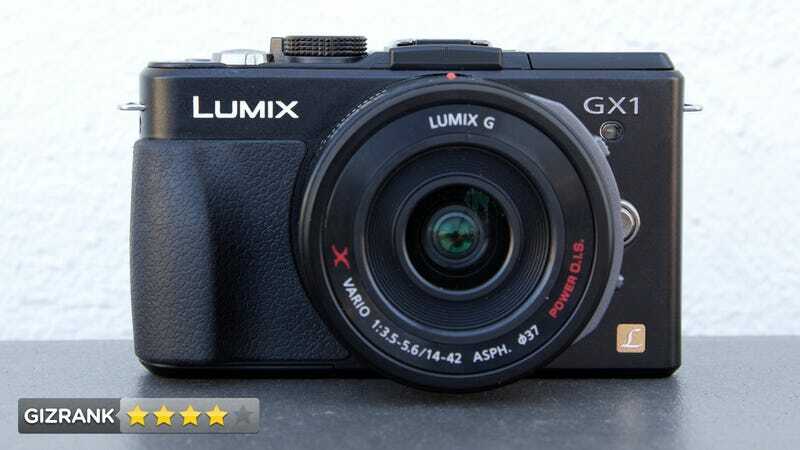 This camera is far more expandable than some of its competitors, and despite the G3's large body, Panasonic G System lenses aren't as bulky as those on APS-C compact cameras. Still, the GX1 is far from perfect, and if it the handling and expandability don't matter to you, go for something cheaper that doesn't run up against the limitations of Micro Four Thirds sensors: The Sony NEX C3 and NEX-5N perform much better in low-light conditions, according to our tests. Check out our samples gallery here.